What a great four days we had – excellent music, delicious food and fun, fun, fun just exploring the city. 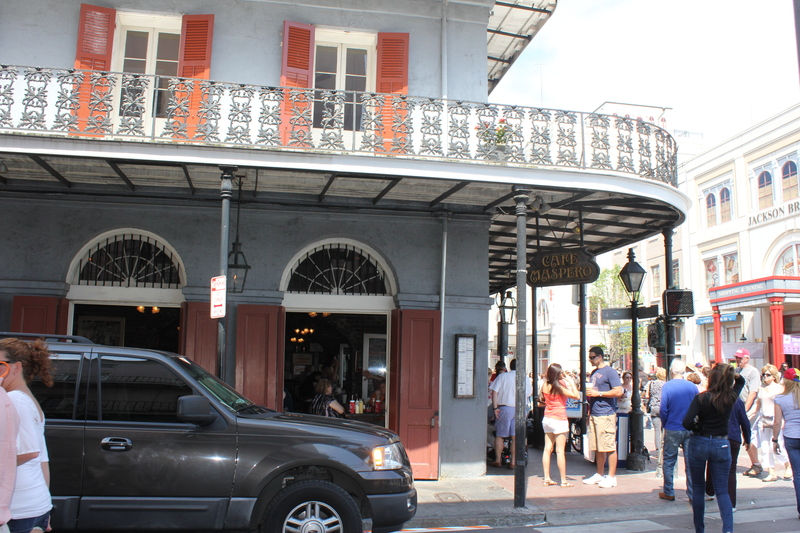 Here are some of the places we enjoyed in NOLA. Domenica (123 Baronne St., New Orleans, LA 70112) was voted one of the Top 50 Italian restaurants in the U.S. in 2012 by Travel + Leisure Magazine, and is part of Chef John Besh’s restaurant group. 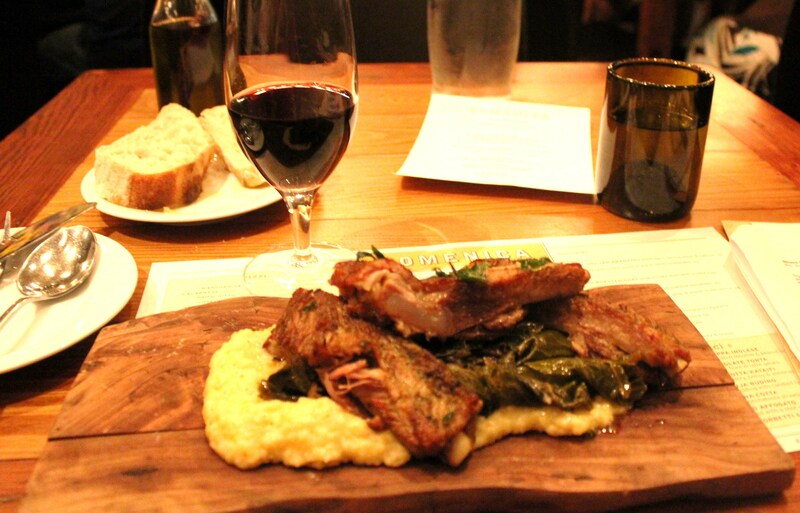 I went last year before it won this award and had one of the best meals I’ve ever had in New Orleans: a rib special with collards and creamy mashed potatoes. Yum! 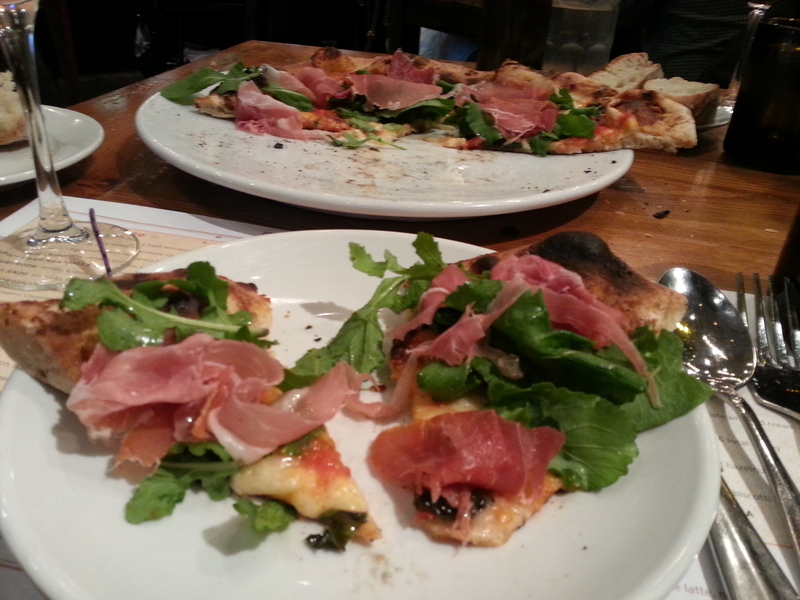 Brad and I decided to share a pizza for lunch and had Pizze Prosciutto with fresh mozzarella and arugula ($13.00). I loved the tomato sauce on this pie, plus it came with lots and lots of prosciutto. Domenica has a rustic, cozy atmosphere and is a great change of pace from more traditional New Orleans fare such as gumbo, muffulettas and other Cajun dishes. SoBou (310 Rue Chartres, New Orleans, LA 70130) This place came highly recommended and it was great! It has a funky, modern interior and offers both small and large plates. 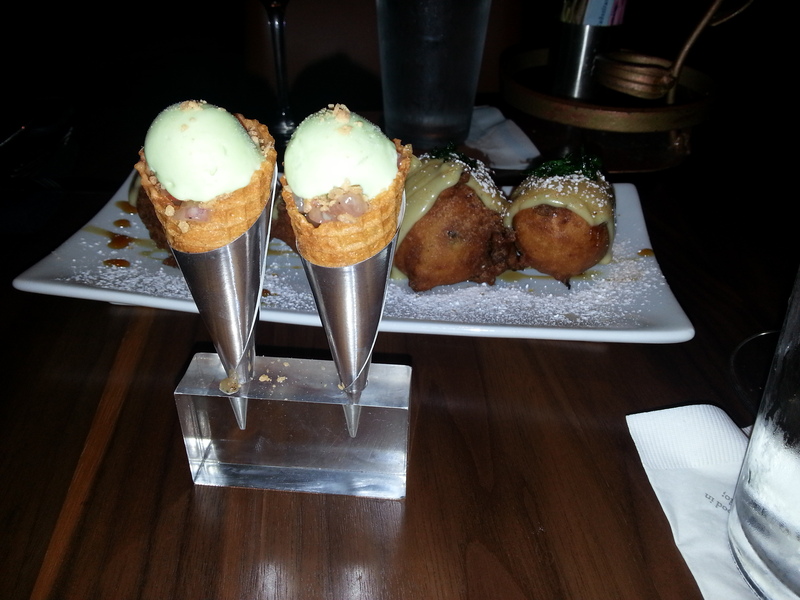 We went with the small plates and ordered the yellow fin tuna “cones” ($8.00) that basically were pineapple & coconut tuna tartare with basil and avocado in little cones. How imaginative, but better yet, how tasty! We also enjoyed the butternut squash beignets ($12.00) that consisted of foie gras fondue, duck debris and chicory coffee ganache. Yum-oh! This is one of SoBou’s signature plates and I can see why. Savory yet sweet at the same time. 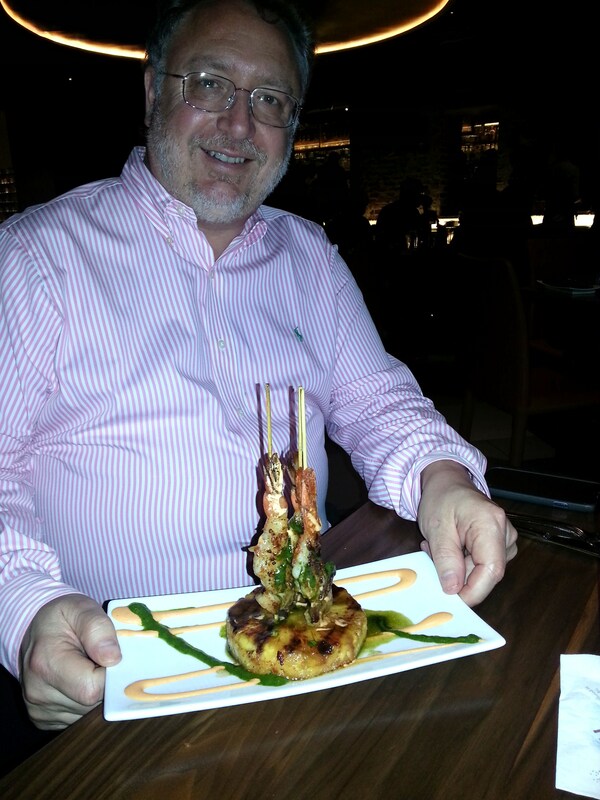 Lastly we decided to split the shrimp and tasso pinchos ($10.00), with grilled pineapple and ghost pepper jelly. All of the food was fresh and full of flavor. SoBou serves breakfast, lunch and dinner, and should definitely be on your NOLA restaurant list. 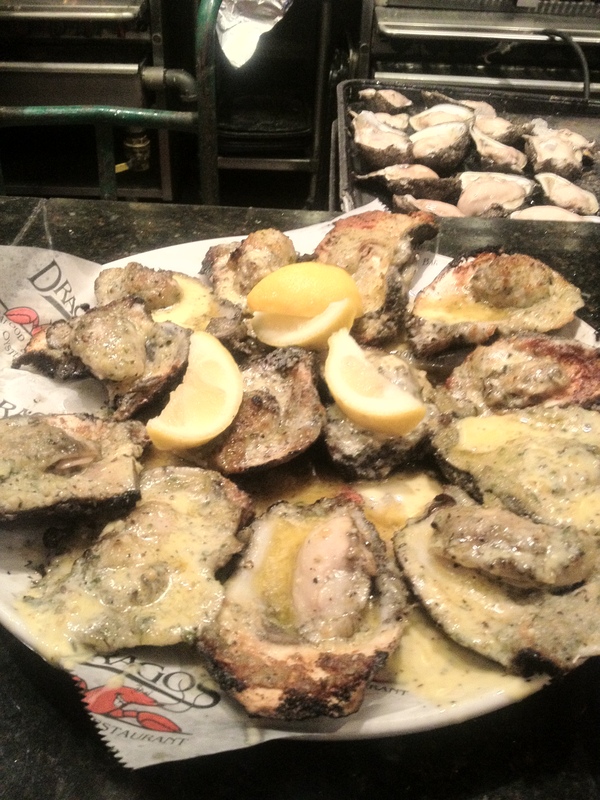 Drago’s Seafood Restaurant (2 Poydras Street, New Orleans, LA 70130) I was here last year and the oysters are still as awesome as I remembered. Brad loved them as well and we wound up ordering another dozen of them. The restaurant calls these morsels “The Single Best Bite of Food in New Orleans” and I have to agree – they are heavenly. The oysters are brushed with a garlic, butter and herb sauce, dusted with parmesan and Romano cheese, and cooked in their shells on a hot grill. OMG! We decided to have the oysters as appetizers and got there around 5:00. 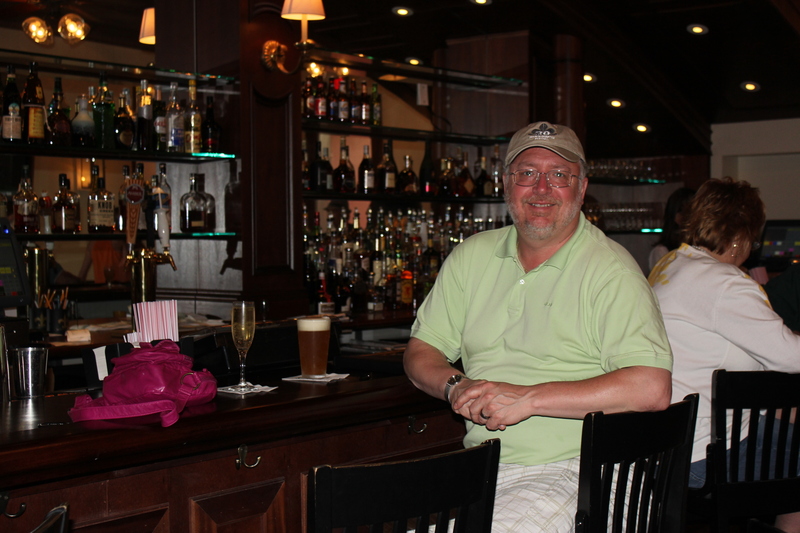 We had no trouble finding a seat – I wanted to sit at the bar to watch them prepare the oysters, but there were many open tables in the dining room. 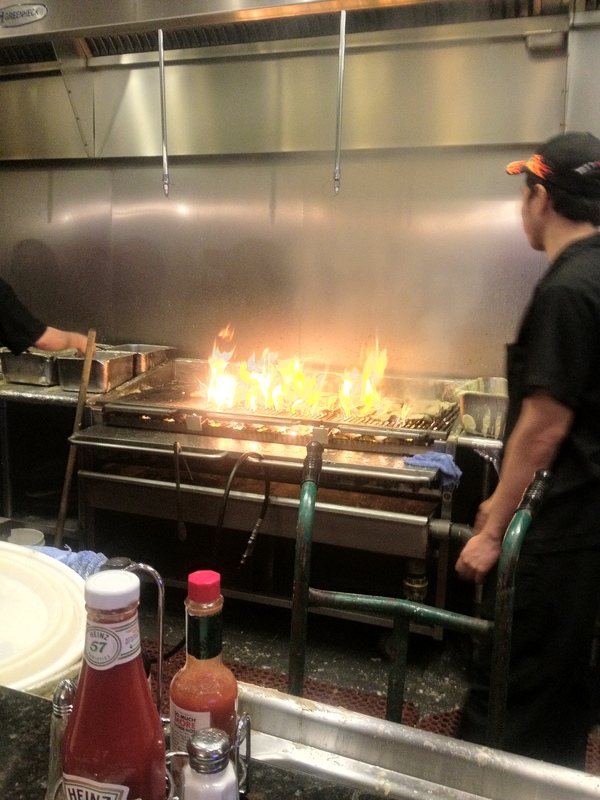 Open seven days a week, Drago’s is located in the Hilton Riverside and does not take reservations. Galatoire’s 33 Bar & Steak (215 Bourbon St., New Orleans, LA) When Brad and I had dinner here it was only the third night this restaurant had been open and overall it was a good experience. 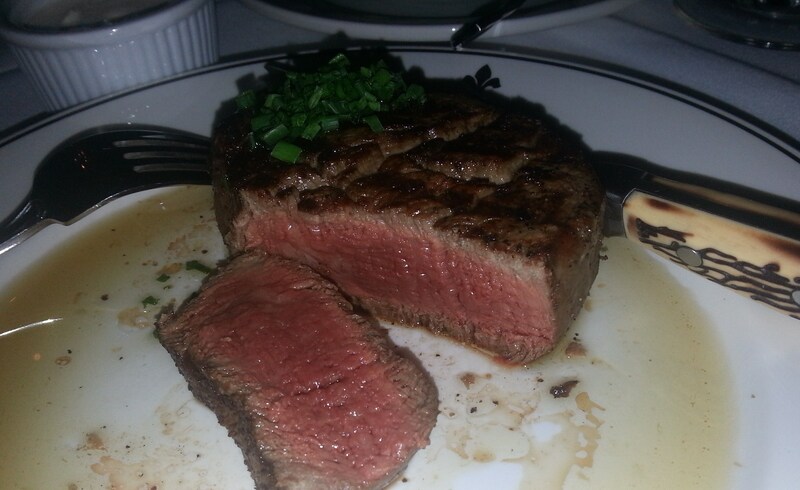 I had an excellent filet with horseradish cream sauce, which was the first steak I’ve had eaten in more than six months, if not longer. The creamed spinach was quite good and I loved the garlic and herb cubed potatoes. Brad enjoyed his strip and thought it was cooked to order. Our wine was excellent. We liked the bar area, which we actually discovered first. It is nice and spacious with friendly service and open seven days a week. 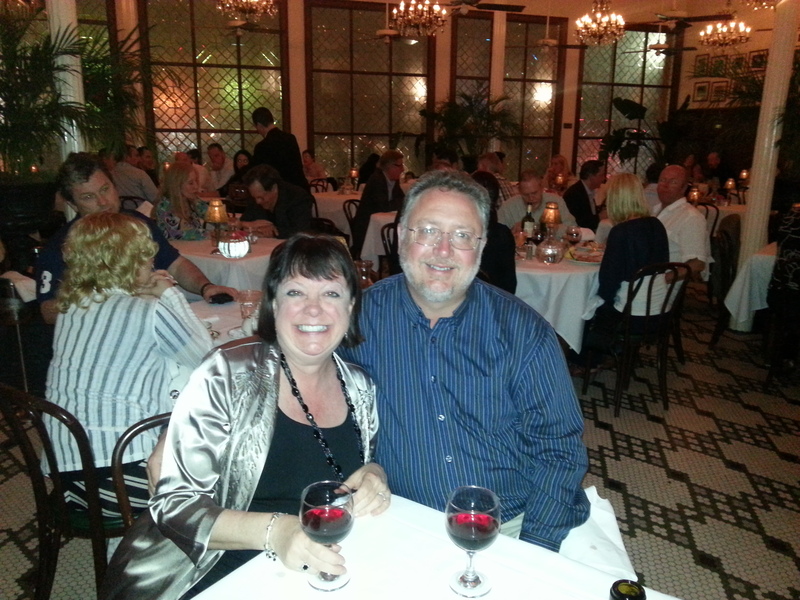 My main recommendation is that Galatoire’s should use a better seating system. There were several empty tables along the walls that stayed empty all evening. In addition, instead of spreading out the tables, people were seated right next to each other, which did not make sense to me since the place never filled up. I would make things comfortable for those who were already there, not for people you are “hoping” will show up. But overall it was a nice dining experience and I would certainly go back. Central Grocery Co. (923 Decatur St. New Orleans, LA 70116) is home to the original muffuletta sandwich, which I tried last year on my visit. 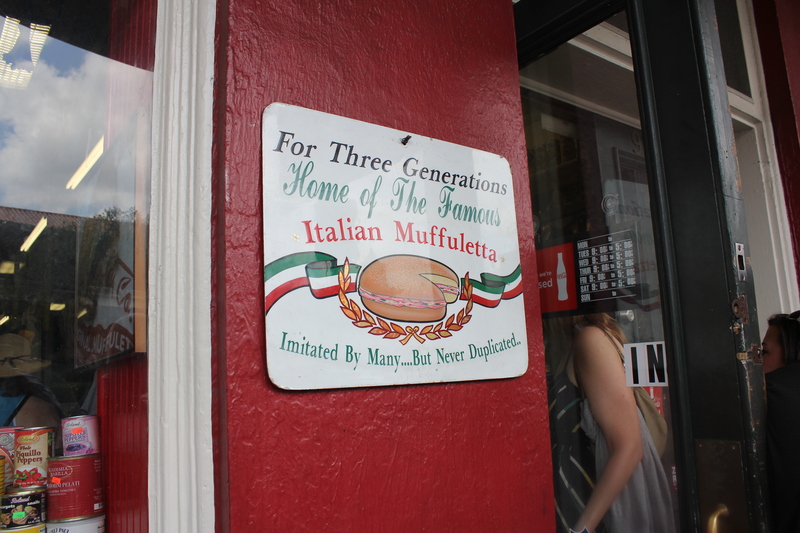 According to numerous websites, it is the standard to which all other muffulettas are judged and I can see why – it was delicious and well worth the wait in line. 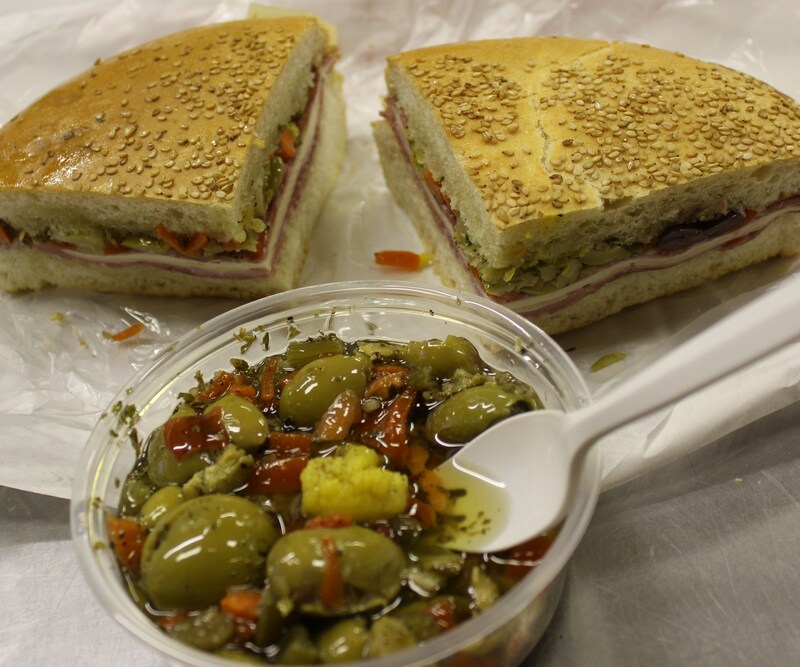 This sandwich is a work of art and the olive salad is phenomenal. There is limited sitting at Central Grocery Company, so be prepared to take your sandwich to go. But do go. Café Maspero (601 Decatur St New Orleans, LA 70130) received good reviews of its muffalettas ($9.00), so we decided to give it a try since it was closer to our hotel plus it had ample seating, depending on when you get there — it does fill up at lunch. 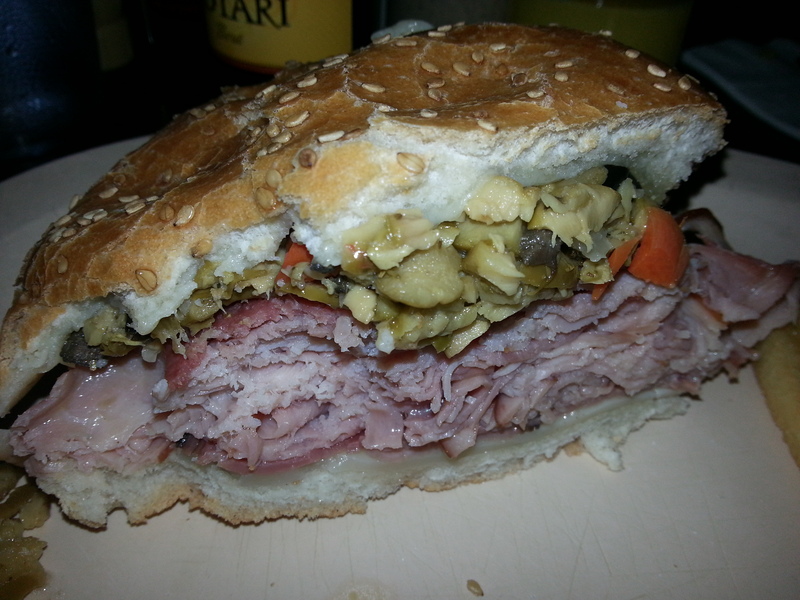 We split a muffaletta, which was a good call as it was quite filling. I loved the olive salad on the sandwich, but wish there had been more of it. This is a nice, airy restaurant that is open seven days a week for lunch and dinner. Brad got a Guinness and for some reason I opted for a Blue Moon. These beers were huge – they came in quart-sized mugs. Oh my. This place is a bit off the beaten path, close to some of the medical centers. It has a nice outside seating area, and the service is laid back and friendly. Pat O’Briens Courtyard (624 Bourbon Street, New Orleans, LA) We only had hurricanes here, but the patio experience is fun, even if it is touristy. You get the keep the glass, or else return it and get some money back. A must stop for a New Orleans tradition. Beware – these go down easy! 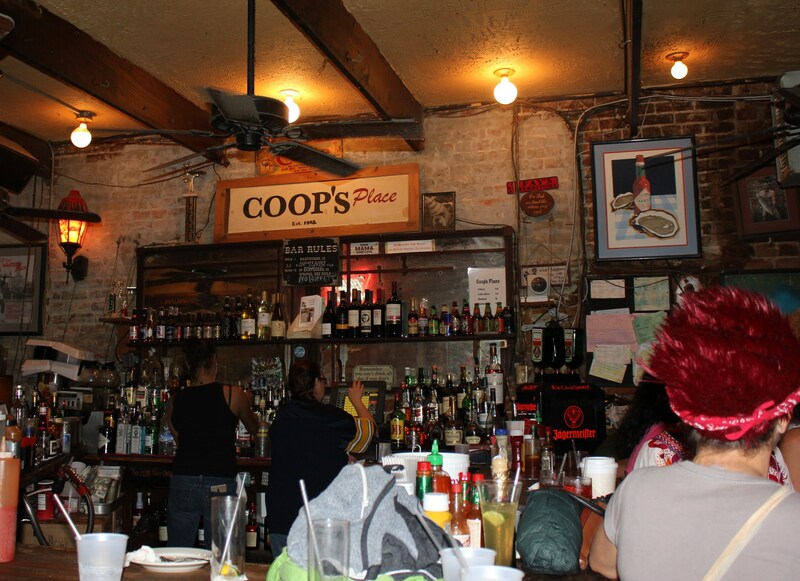 Coop’s Place (1109 Decatur St. New Orleans, LA 70116) Brad had read that Coop’s had great jambalaya so we headed there for lunch one day and I’m so glad we did. 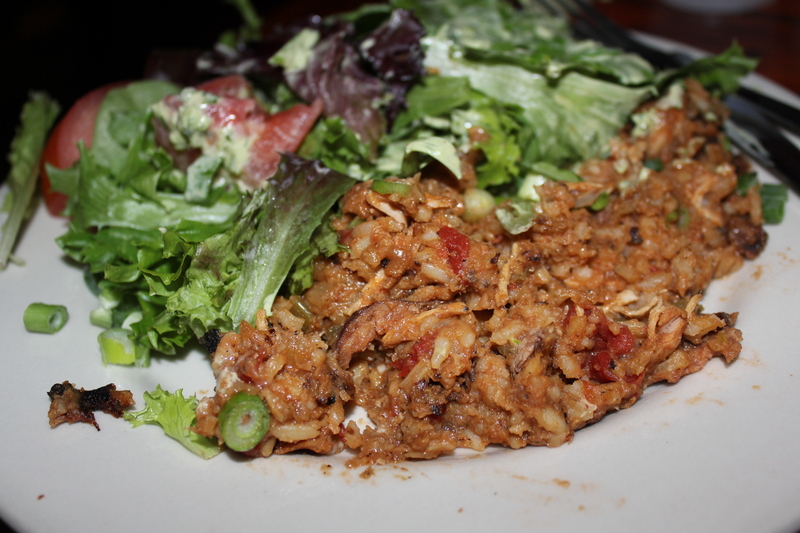 I got the rabbit and sausage jambalaya ($8.95) which rocked. It came with a side salad with homemade green goddess dressing that was excellent! This is a small place that does not allow patrons less than 21 years of age since it has video poker machines. We were seated right next to a group of folks who were having a 70s disco party – they were loud, dressed in period and having an awesome time. Only in New Orleans! A great place with “down-home prices! Arnaud’s (813 Rue Bienville New Orleans, La 70112) Established in 1918, Arnaud’s has been serving quality Creole cuisine and currently is operated by a fourth generation of owners, Katy and Archie Casbarian, who are committed to keeping original founder Arnaud Cazenave’s traditions alive. We ate here our last night in New Orleans and the place was packed. 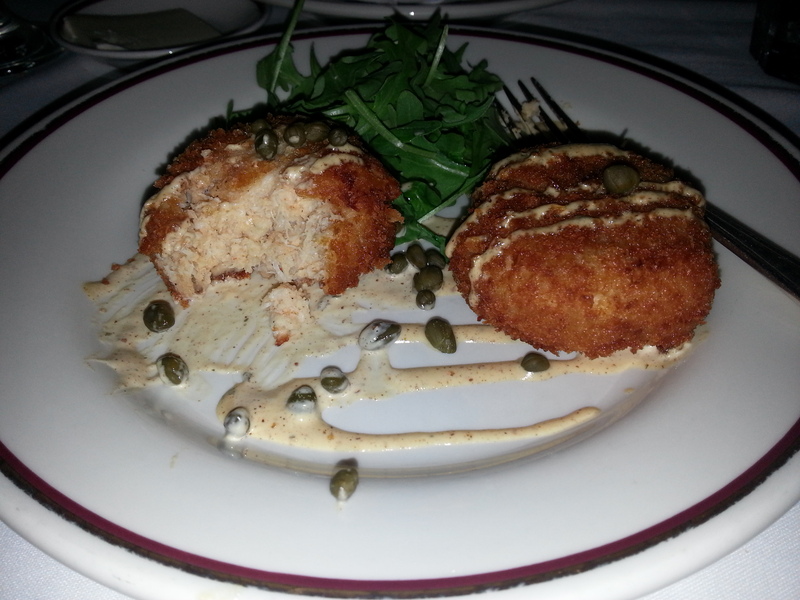 Brad got the speckled trout amandine ($28.95) and I had Arnaud’s crab cakes ($31.95), which were out of this world! We split dessert and had the Strawberries Arnaud, with fresh strawberries marinated in port and red wine with vanilla ice cream ($8) — yummy! The service was spot-on, and I would certainly go back on my next visit. 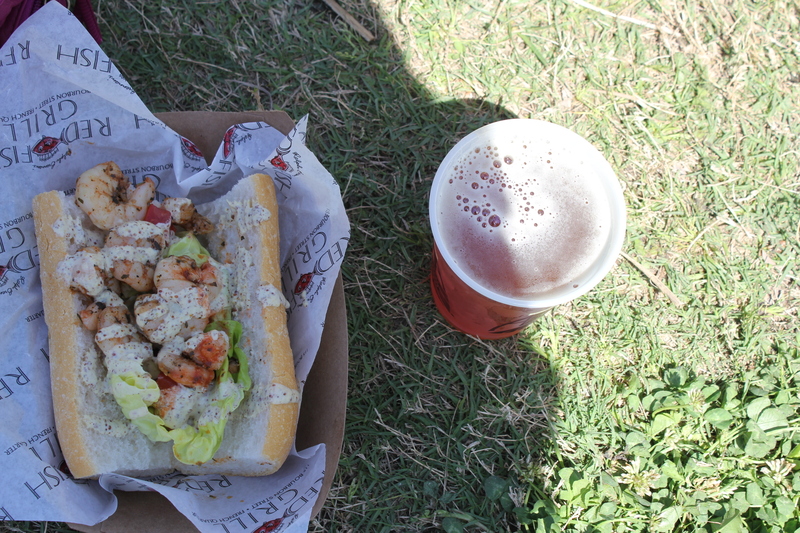 We also took advantage of a couple of the food vendors that were located throughout the festival. This is a good way to sample some of the places you may have not had a chance to try otherwise, while listening to great music at the same time. New Orleans is a fun, fun city fit for foodies (doesn’t hurt if you’re a drinker, either!) I’m looking forward to my next visit! This entry was posted in My Favs, Restaurant Reviews and tagged Arnaud's New Orleans, Cafe Maspero New Orleans muffuletta, Central Grocery Company New Orleans, Coop's Place New Orleans jambalaya, Domenica New Orleans, Drago's Seafood Restaurant New Orleans, eat drink and be merry, French Quarter Fest New Orleans, Galatoire's 33 Bar & Steak New Orleans, Happy's Irish Pub New Orleans happy hour, kel's cafe of all things food, New Orleans restaurant reviews, Pat O'Brien's Courtyard New Orleans, SoBou New Orleans. Bookmark the permalink. BEST food on the earth. Nice review Kelley! Thanks, Michelle! Too bad we weren’t down there at the same time. 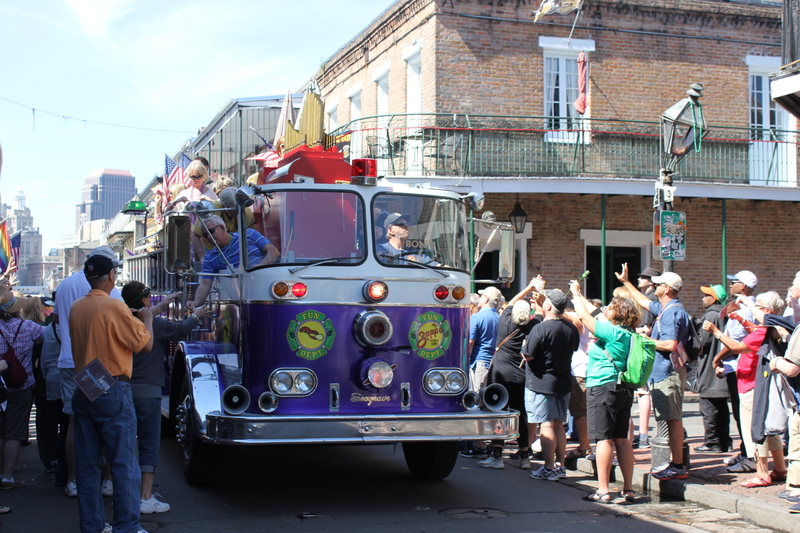 There’s so much to see and do in New Orleans, it’s impossible to pack it all into one weekend, but if one weekend is all you’ve got, here’s how to make the most of it. 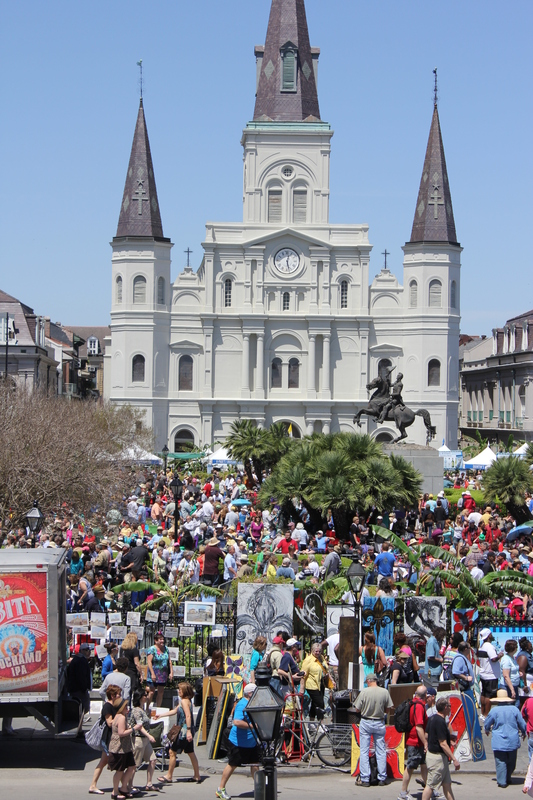 Spend one day in the French Quarter and one day Uptown. Try to hit some of the excellent fine dining restaurants as well as the more casual places with authentic New Orleans fare. 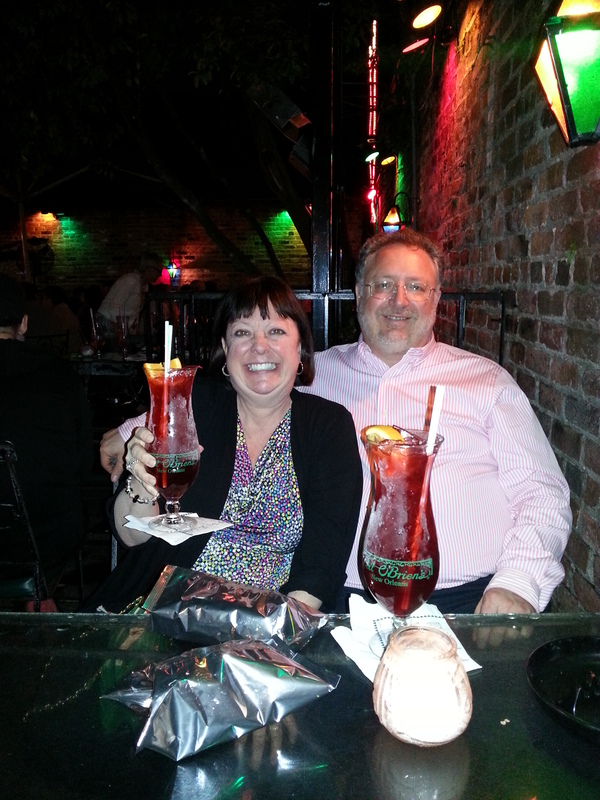 Have a wild night on the tacky but fun Bourbon Street then have a night listening to live jazz or a brass band at one of the many New Orleans music venues. And remember, wherever you go, you can go there with a drink in your hand. 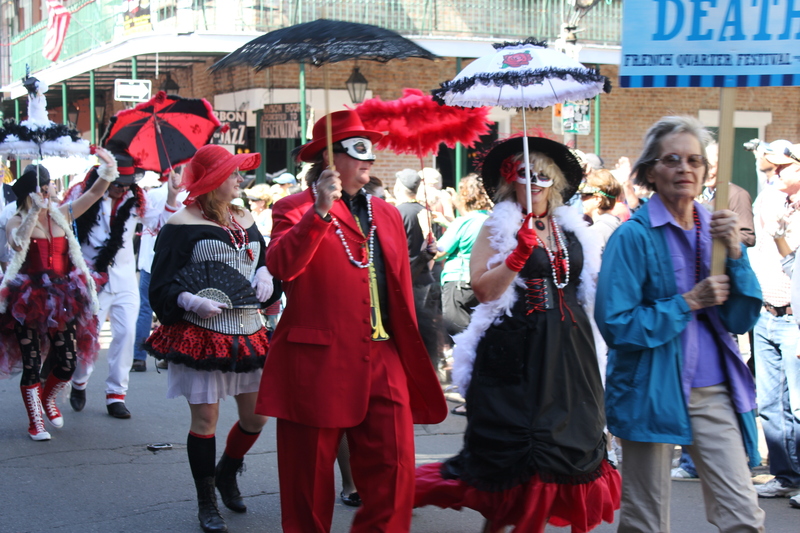 This is the ultimate New Orleans weekend, after all! Yes, Heidi, I agree there is just too much to do in New Orleans in just a long weekend. All of your suggestions are great! The jazz is great as is the food. I can’t wait to go back!